Posted on August 10, 2014 by Warin	in 2 Brown Girls, 2 guys 1 Show, Elon James White, His and Hers, Jemele Hill, Michel Martin, NPR, radio. This one hurts me a lot. 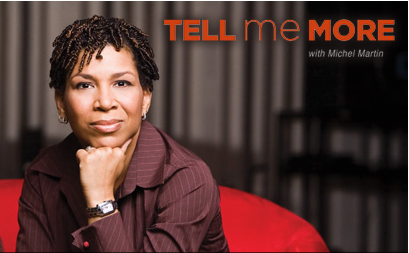 Tell Me More, a radio show hosted by Michel Martin and broadcast on NPR, had its mic permanently turned off last Friday, August 1st. Tell Me More was unique in that not only was it a show that centered around the stories and experiences of people of color, but it was hosted by a black woman. Because of this, the show was more keen on topics of particular interests to people that are often ignored or forgotten about by mainstream audiences. Sadly, this unique outlet was lost to something all too common within the radio industry these days: budget cuts. Radio has been fighting a bit of an uphill battle for awhile now, with public radio increasingly facing the pressure of cutting back. While Michel Martin will keep her job at NPR, the same can’t be said for the rest of her staff. Where they go from here is anyone’s guess. If there are any positives in this, it’s that media is changing and there more outlets than ever to hear previously disenfranchised voices tell their varied stories. TWIB (This Week In Blackness) hosted by Elon James White, is one such show; there’s also 2 Brown Girls, His & Hers, which features ESPN personalities Michael Smith and Jemele Hill; and finally, there’s 2 Guys 1 Show, hosted by Rich Jones and Wisdom Is Misery. So there are still diverse opinions/voices out there, just not on NPR. Where traditional media may be losing out on voices of color, social media and podcasts have begun to fill a void. Don’t let anyone silence your story.